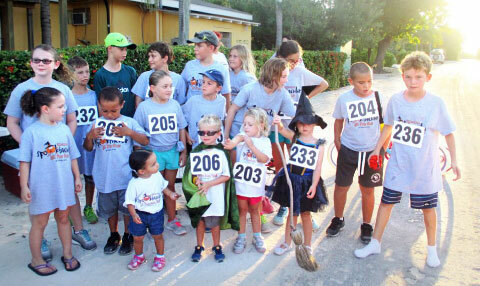 The Spooktacular 5K Fun Run was held Oct. 30 in Little Cayman to raise money toward improving the Blossom Village children’s playground. With 47 entries and $1,000 raised, participants said the event was a success. The winner was Douglas Anderson, with David Harmon and Don Broadbent placing second and third, respectively. “We were very pleased with the turnout, especially with the number of kids who participated. It was a nice start to the Halloween weekend, which marks the opening of the resorts in Little Cayman and was followed on Saturday by Happy Hour at Southern Cross and a costume party at Pirates Point,” said Carla Reid, one of the organizers. She noted that because the run coincided with the mid-term break for most schools, there were quite a few visitors from Grand Cayman. Thanking sponsors Jacques Scott Group, Sports Association of the Sister Islands and Iguana Crossing Liquor Store, organizers say they hope to make this an annual event.